With thanks to Rosie & Fran for showing me how to make this many years ago. Rough chop the vegetables into fairly large chunks (bear in mind that they will shrink while cooking). Leave the garlic cloves whole. In a large roasting dish, toss the vegetables and pine nuts in olive oil and cook in the oven for about an hour. While they're cooking, prepare the sauce: Mix the honey, grated ginger, zest of the whole lime and juice of half the lime in a cup. You might want to add more honey if you find the taste a little sharp for your liking. 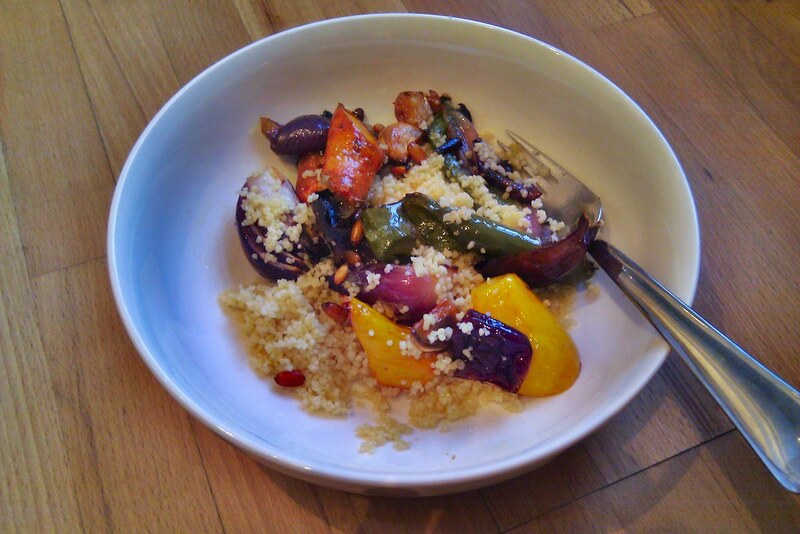 Once the vegetables are done, prepare the couscous according to the packet instructions. Serve by the layering the couscous, then the vegetables. Drizzle the sauce over the top. Meat eaters might like to serve this with a grilled chicken breast or some lamb skewers.